Nope. I also love decorating with pineapple decor. After all, the pineapple symbolizes warmth, welcome, friendship and hospitality – all the things you want people to feel in your home! 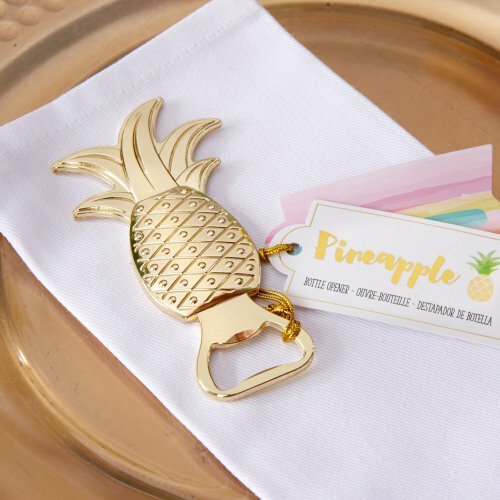 And, all of the things you want your guests to experience at your wedding – which makes this pineapple bottle opener the perfect wedding favor! You could add a cute tag to each bottle opener and use them as seat markers too – they’re multi-functional and cute! And the pineapple bottle opener just looks like spring and summer – which makes them perfect for your upcoming warm-weather nuptials. You can find this pineapple bottle opener here.